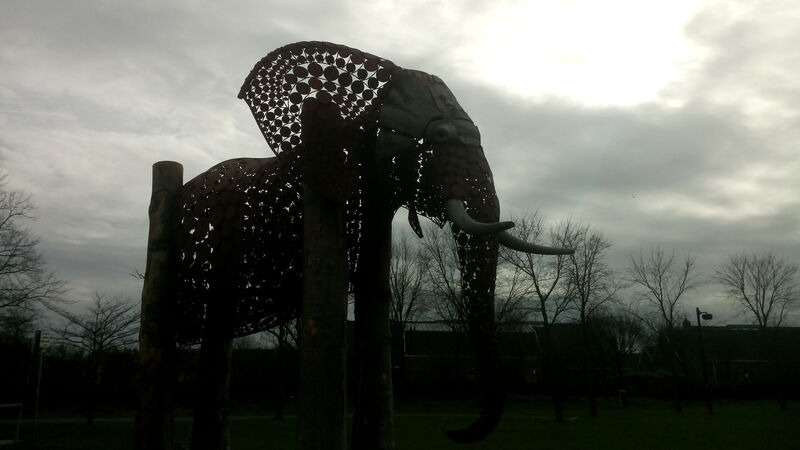 “The Weeping Elephant’, is a sculpture of an African elephant five meters high. She will travel around the world and appear in cities, she ‘weeps’ to make her presence felt. On her journey she want to join forces during events; conservation, art & culture related, with experts, enthusiasts and artists to bring an ode to the wild. The stage under the sculpture is a meeting point for special guests; speakers, musicians, dancers and children to share their message with the world. Elephants are often portrayed as sad animals. 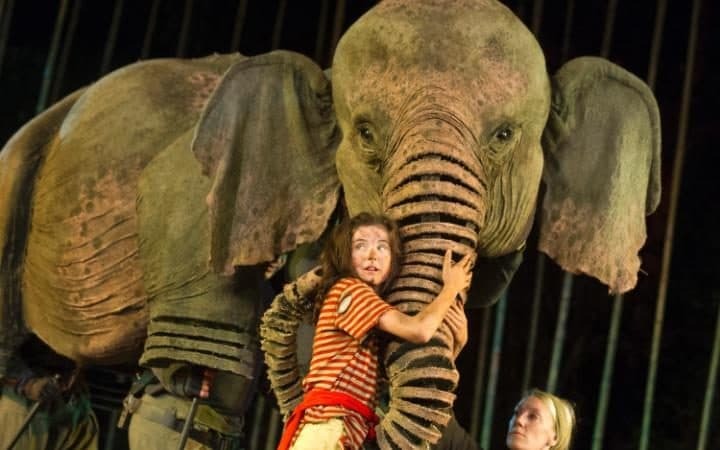 Think of those in literature; Dumbo,who is separated from his mother at an early age; Rosie, the abused circus elephant in Sara Gruen’s fantastic book, Water for Elephants which when made into a film sparked a real-life animal abuse storm about the elephant who played Rosie, Tai. Controversy erupted around concerns that Tai was mistreated prior to filming, Water for Elephants. A video released by the Animal Defenders International (ADI) in 2011 shows footage of Tai allegedly being shocked with handheld stun guns and beaten around the body and legs with bull hooks, while in the care of Have Trunk Will Travel in 2005. The ADI contacted the American Humane Association, urging them to re-evaluate how they assess the use of animals in films and the statements being made which effectively endorse the use of performing animals. 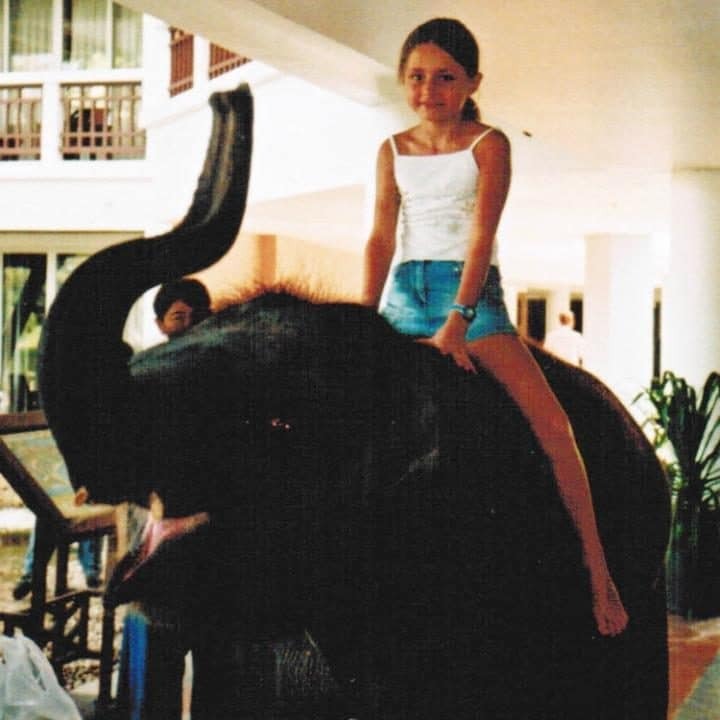 “When I was born, there were one million elephants roaming Africa. By the time my daughter Charlotte was born last year, the numbers of savannah elephants had crashed to just 350,000. So what is it about these pachyderms that invokes this deep-rooted sense of guilt about the way we treat the natural world? Is it their very strong family bonds which we identify with, or perhaps their immense strength and gentleness combined? Why not go to the Westerpark and think about it? 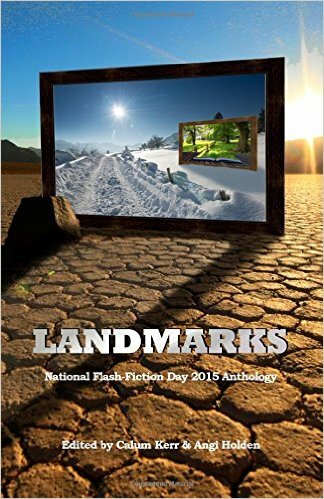 Perhaps you will be moved to write a poem, draw a picture or make a donation to the WWF. Don’t wait too long though because at the end of April, Weeping Elephant’s packing her trunk and moving onto pastures new. 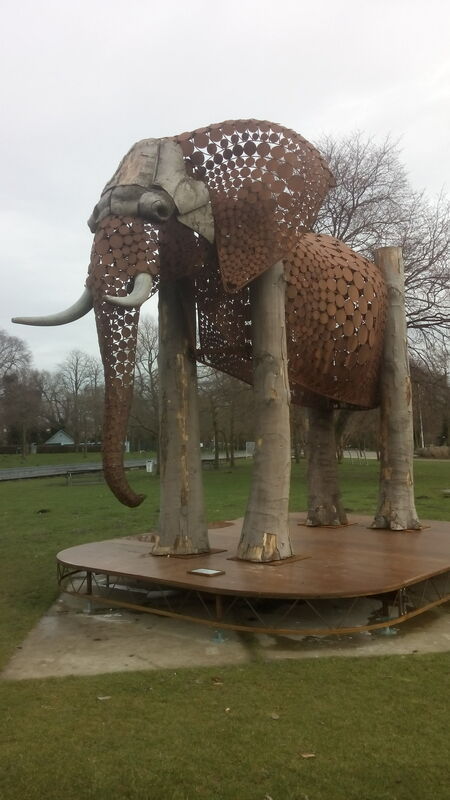 This entry was posted in Uncategorized and tagged Amsterdam Westerpark, An Ode to the Wilderness, endangered species, Jantien Mook, Michael Morpurgo, Ode aan de wildernis, Running Wild, Sara Gruen, sculpture, Water for Elephants, Weeping Elephant. Bookmark the permalink. Thank you, Angela. You do get about! And a really good cause to draw our attention to. I’ll definitely try and get hold of the novel. It is so incredibly sad what is hapening to these wonderful animals.